Graphite, also known as black lead, crystallized carbon, plumbago, and mineral carbon, has been mined and used for a surprisingly large number of applications. Amateur boatbuilders use it to coat parts that need to slide against each other like centreboards or to coat the hull to make small boats go over rocks better. Graphite is a grey crystalline, allotropic form of carbon. Allotropy is the property of an element to exist in several different forms in the same physical state, in the case of carbon, the solid state. Carbon can exist as diamond, coal, graphite, graphene and fullerenes and several other forms. Graphite is a naturally occuring form of Carbon that is mined, ground and separated into desired sized particles. Graphite is the most stable form of carbon found under standard conditions. Most available forms of graphite available are between 90% and 95% pure carbon. The remaining 5% to 10% is mostly silica. It is possible to further process the graphite to purify it and reduce the silica and other impurity content. Graphite can also be manufactured. This is usually done starting from coke. What is the structure of graphite. The internal structure of graphite is in the form of flat sheets of hexagonal crystals. The force holding the flat sheets to one another are not strong and are easily broken allowing the sheets to slide against each other. The sliding sheets partly explains the sliperyness of graphite. Another factor that comes into play is SUPER LUBRICITY The link is to the Wikipedia Entry. Because it is so slippery, one of the major uses of graphite is as a lubricant. Being chemically quite inert (it is sensitive to strong oxidizing agents, and the fine powder can burn in the presence of oxygen) and non toxic makes it very useful. It does stain and leave dark marks though. This ability to leave dark marks is what makes a "lead" pencil write. The lead is actually graphite that is shedding some of itself on the paper. By itself graphite is quite soft but it can be mixed with clay to make harder leads. Graphite contains delocalized electrons, essentially free electrons. 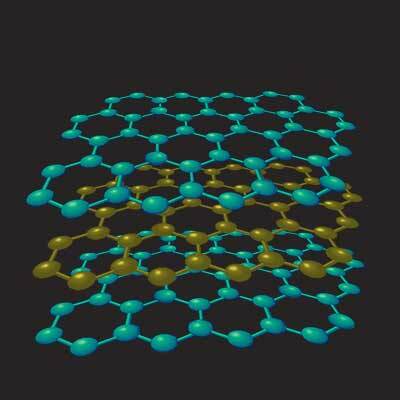 These free electrons allow graphite to conduct electricity. Although graphite, diamond and carbon fibres, among other forms of carbon, can conduct electricity quite well in some applications, graphite makes good electrodes as in electric motor brushes, epoxy is not a good conductor. So continuous fibres can conduct well but epoxy/graphite composite is not a great conductor. It can however conduct and the danger of galvanic corrosion is present. Galvanic corrosion has been observed in fitting used on carbon fibre masts and spars. Generally a graphite epoxy coating is too resistant to electricity to be useful but not resistant enough to ignore. 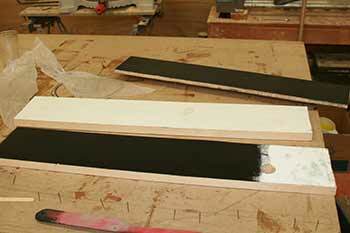 For this reason if you decide to coat your centreboards, hulls or any other structure in a boat to reduce friction, any fitting or pivot should not touch the graphite mixture and be isolated from it by a non conductive material, such as epoxy resin or many of the bedding compounds available. Conductivity of Carbon fiber or graphite reinforced materials is a problem that has been studied by people who want to make structures that might be exposed to lightning or galvanic corrosion. Under normal use it is very safe and requires minimal protection. Don't breathe it and keep it out of your eyes and mucosa. It can be irritationg to skin and eyes and if ingested to the digestive track. Avoid repeated or prolonged exposure. It is not a known carcinogen or mutagenic substance but because natural graphite contains some silica in crystal form, prolonged repeated exposure should be avoided because silica can cause lung damage and even cancer. Graphite has a density of 2.2-2.3. water is 1. It packs quite densely. This means it is quite heavy and does not easily fly into the air if disturbed. Anyone who has worked with fumed silica has had to deal with the fly away nature of silica which does not pack down at all. Graphite is much better behaved and stays put. When using graphite with epoxy take the usual care. Epoxy is the more toxic of the 2 and wearing gloves, respirator and goggles will take care of most dangers. 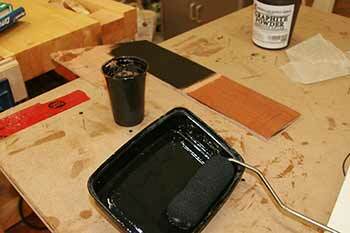 If graphite is being mixed with a binder such as epoxy then the usual safety precautions for epoxy should be taken. At the very least, well ventilated area and better still, use a respirator. Why is it added to epoxy in boat building? Graphite is a lubricant and used in epoxy can facilitate one surface gliding over another. This is useful for centreboards sliding in their case. Many people have used it as a hull covering for crafts that might have to slide over rocks. There is some controversy about this later use. The argument is ...yes it might allow the boat to glide over rocks, but since the epoxy/graphite composite is softer than just epoxy then there is a greater chance of large scratches since the finish is not as hard. One advantage of graphite is the handsome black finish it makes. The graphite protects the epoxy against uv degradation and does not require the usual protection. I don't think it is easy to get a smooth finish. People report an orange peel surface texture when more than one coat is applied. I will be running some tests to see how graphite behaves and will report. One problem with graphite epoxy is that if exposed to hot sun in a warm area, the graphite/epoxy can get hot enough to soften the epoxy and cause damage. I bought the graphite from a company on Ebay, Fiberglass Supply. None of the US companies on Amazon I found would ship economically to Canada. 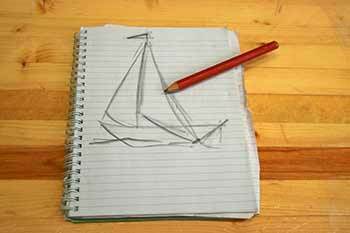 I know that West Systems sells graphite for boatbuilding but I'm not near any West Marine. It is quite heavy and when I opened it I expected it to fly out but it stays nicely in its container. I had trouble photographing the powder because it does not want to focus. The camera sends a beam of light which is reflectled back usually and this is used for focusing. In this case most of the light was absorbed by the very black powder so the camera could not focus. Eventually I focused on the edge of the container. The graphite was not difficult to mix in. 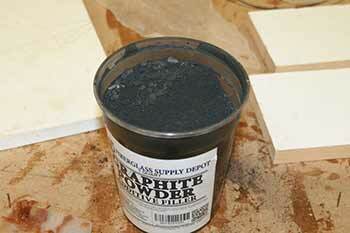 It takes a lot of graphite powder to thicken the mixture. The same amount of silica would have made a very stiff paste. The mixture was still runny and flowed easily. I painted some epoxy and some graphite mixture on a few boards. The epoxy went on thinner than the graphite, not surprising because it is thinner. The graphite went on as a thick coating. I'll build up a good coating on both so I can test them. Wikipedia has a very good article on Graphite. The entry on the different uses is quite interesting. Graduated mixing cups are useful for measuring small quantity of epoxy. Epoxy and measuring pumps from West System. Colloidal Silica is a component of epoxy glue mixture. I don't claim to be an expert. I'm not an engineer. IF you want to build a boat, take proper precautions. This information is for general knowledge only. I link to Amazon.com for some products. I try to make sure the products are appropriate but I have not necessarily tried them all and inclusion on the page is not a Recommendation. Make sure you are buying the appropriate material for your use. Otherwise have fun.